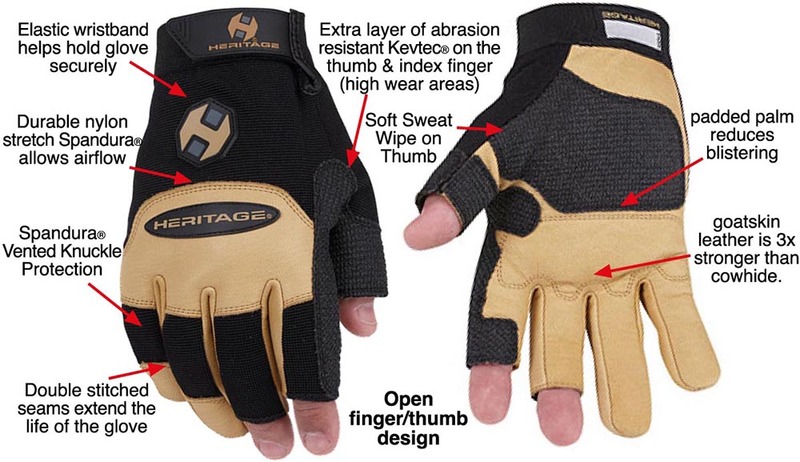 Heritage has been making gloves for other facets of the equestrian industry for over 30 years. That expertise in manufacturing technically advanced and innovative riding gloves has now been applied to a glove for farriers. Goatskin leather & synthetic materials. Are your hands covered with cuts and scrapes? Wear out gloves instead of your skin! Recognize that your HANDS are one of the most important tools that you use, and protect them accordingly. With wear, your gloves will become tattered, but consider that the damage they sustain would have been to your skin. Shown here is a tough, protective farrier glove that's made by riding glove manufacturer Heritage. These utilize goatskin leather, as opposed to the all-synthetic IronClads. These also come in Extra Small; I've had many requests for this size and previously was unable to offer.